Homelessness in England has reached “crisis” levels, according to a report released by the House of Commons Public Accounts Select Committee shortly before Christmas. 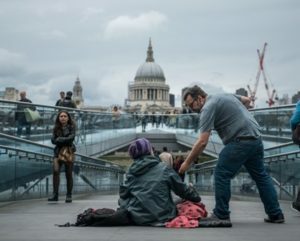 There is overwhelming evidence to support the claim that homelessness has become this serious, as a range of major societal problems – including rising housing costs, stagnant incomes for those near the bottom of the labour market, and high levels of domestic violence and poor mental health in disadvantaged communities – have collided with the privatisation of social housing and government austerity policies to create a perfect storm from which increasing rates of homelessness among a great swathe of the UK’s most vulnerable citizens was the inevitable result. However, much of the debate surrounding homelessness in the UK (including this select committee’s report) is primarily concerned with the worryingly high number of people who are considered “officially” homeless, which means they satisfy a set of criteria that entitles them to being housed by the public sector in one form or another. Meanwhile, the kind of images which homelessness conjures up in the popular imagination still tend to revolve around people who beg for money on street corners – even though people who sleep rough represent quite a small minority of the overall number who are homeless. Complicating the picture still further, other research has also appeared recently which suggests that there may be an additional epidemic of “hidden homelessness” which primarily affects vulnerable young adults, who are being undercounted in official statistics. So, what is “hidden homelessness”, and how many young people does it affect? The homeless are a group who are, almost by definition, challenging for government statisticians to perform a headcount of, as most of the major social surveys that are collected in the UK use physical addresses as their primary sampling units; in other words, they make a basic assumption that everyone has a permanent place of residence at which they can be counted, whereas the absence of such an address is homeless people’s defining characteristic. As suggested above, counting the homeless is also made very complicated by the fact that they are not a discrete group, but are in fact one which includes an extremely wide variety of different people living in many different types of circumstances. A recent BBC article provides a handy guide to the different definitions of homelessness that are currently used within England (housing being a devolved matter, the circumstances are different in the other nations that make up the UK). To reiterate the point made above, the official estimates of rough sleepers – which are produced by local authorities undertaking counts of the people sleeping rough in their areas, as well as data on the number of users of local services – suggest that only around 4,000 people are sleeping rough on any one night in England. Clearly, that is 4,000 too many (and the number is thought to have doubled since 2010), but the bigger point is that this is a very small number in relation to the 77,000 families (which include over 120,000 children) who are currently living in temporary accommodation because they have been declared statutorily homeless. Getting recognised as statutorily homeless is actually very difficult; in order to do so, a family has to satisfy their local authority on two counts. Firstly, they need to prove that they do not have access to a property which they have a legal right to occupy, which is accessible and physically available to them, and in which it would be reasonable for them to continue to live. Secondly, the public sector only has a legal duty to house people who meet these criteria if they are in a category that has “priority need”, which includes those categories which contain pregnant women or dependent children (up to age 18, or 20 if they were previously in care), people who are physically or mentally disabled, “people who are vulnerable as a result of time spent in care, custody or the armed forces”, or people who’ve had to flee their homes because of violence or the threat of violence. Over 28,000 households that have been recognised as homeless in the past year have not been rehoused because they did not contain anyone who was in priority need, essentially leaving them to their own devices. The number of households being recognised as homeless and in priority need has risen dramatically since 2009, with the most common reason for a household becoming homeless now being the termination of a private rental sector tenancy agreement. In summary, it is now widely recognised that there is a rapidly growing epidemic of families becoming officially homeless and ending up in temporary accommodation; and much of that accommodation is reckoned to be of poor standard (as several contributors to the Public Accounts Committee’s report highlighted). This crisis is being driven by the increase in rental costs while family incomes remain stagnant in many parts of the country, which is exacerbated by restrictions on housing benefit and the inadequate supply of social housing. Many of the victims are children – who, evidence suggests, do worse at school than other children if their families are declared homeless. However, as big as these problems are, they don’t include the hidden homeless who were referred to earlier. The hidden homeless are people who lack a regular address but aren’t officially recognised as being homeless by their local authorities, yet also might not be sleeping rough (at least not on a regular basis). So where are they living? The BBC recently commissioned some new research which examined the incidence of young people (aged 16–25) who are of no fixed abode. They found that over 40% of those asked said they had slept on someone else’s floor or sofa for at least one night in the previous year because they lacked anywhere else where they could sleep (excluding people who were staying over with friends after a night out, for example), and nearly 10% said they had been in this position for at least a month. Interestingly, there was quite a marked gender divide within these data, with almost half of the young men who were interviewed saying they had done it compared with only just over a third of the young women. This may possibly reflect the fact that women are more likely to be recognised as being in priority need by their local authority, because they are more likely to be looking after children or to be fleeing domestic abuse. These findings support those of an earlier piece of research that was performed by academics at the University of Cambridge’s Centre for Housing and Planning Research in 2015, which estimated that in a given year around 1.3 million 16–24 year-olds find themselves homeless for at least one night of the year, and around 300,000 are in this position on any one night. Similarly to the BBC survey, the authors of this research found that 10% of young people had been without a home of their own for multiple nights. When the BBC researchers looked at the reasons why young people ended up in this position, they found they offered a wide range of explanations, including their parents being unable or unwilling to provide housing, extended family being unable to help, splitting from a partner, tenancies ending, domestic abuse, rent arrears and leaving care. This evidence has a number of important implications. First and foremost, it highlights the scale of the housing crisis facing young adults, many of whom are unlikely to be either counted or assisted by the state unless they have children of their own, for the cruelly ironic reason that they are considered insufficiently vulnerable to require it, however inaccurate this categorisation may be in practice. Secondly, it also serves to emphasise how the UK’s other “housing crisis” – which is possible to caricature as something that primarily affects middle-class young professionals who fret about being unable to get on the housing ladder – in reality affects everyone at all levels of society: the key point is that while these young people’s reasons for not having a fixed abode are remarkably diverse, the unaffordability of housing means that people have much more to lose from situations such as family breakdowns, splitting from a partner or fleeing domestic abuse than they would do if housing was more generally affordable. The housing crisis raises the stakes for everyone, and for too many young people, it means that the precariousness of their housing situation robs them of a vital sense of stability across the rest of their lives as well.